Rescue ships looking for 31 missing crew members from a burning oil tanker have expanded their search area to more than 1,000 square miles (2,600 sq km), authorities said. 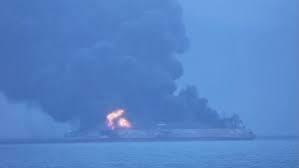 The move comes six days after the Iranian-owned Sanchi collided with a freighter in the East China Sea and burst into flames. The cause of the collision remains unclear. Chinese state television cited officials at the scene in reporting on Friday that authorities still have not found any survivors or put out the blaze on the Sanchi. One body has been recovered. Twelve ships spraying foam are struggling to extinguish the tanker, which was carrying a cargo of nearly one million barrels of condensate, a type of gassy, ultra-light oil. Search and firefighting efforts resumed on Thursday after an onboard explosion rocked the tanker on Wednesday. Intense flames, bad weather and poor visibility have hampered rescue efforts and Chinese authorities fear the ship could explode, potentially setting off an environmental disaster. The Panamanian-registered vessel had a crew of 30 Iranians and two Bangladeshis. The Chinese freighter CF Crystal. had 21 crew members, all of whom were reported safe.